Already, Octave 9 has hosted the first collaborative concert curated by the season’s composer-in-residence, Derek Bermel. 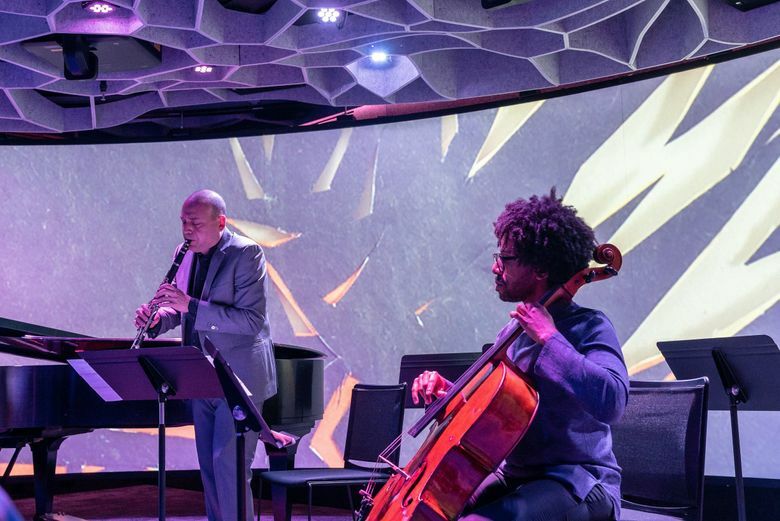 On March 10, the clarinetist-composer presented and performed in an intriguing exploration of the confluence of classical and jazz elements in the history of American music, partnering with Seattle artist Barbara Earl Thomas to include a layer of visual commentary. Seattle Symphony envisions Octave 9 as a place for audiences to experiment with the concert experience as well. On March 23 and 24, the Symphony is presenting a nonstop marathon of contemporary music at Octave 9 that will start in the early evening, proceed through nightfall and daybreak, and conclude exactly 24 hours later: the entire life cycle of a day, matched with music as well as visual accompaniment presented on the space’s reconfigurable bank of surrounding screens. 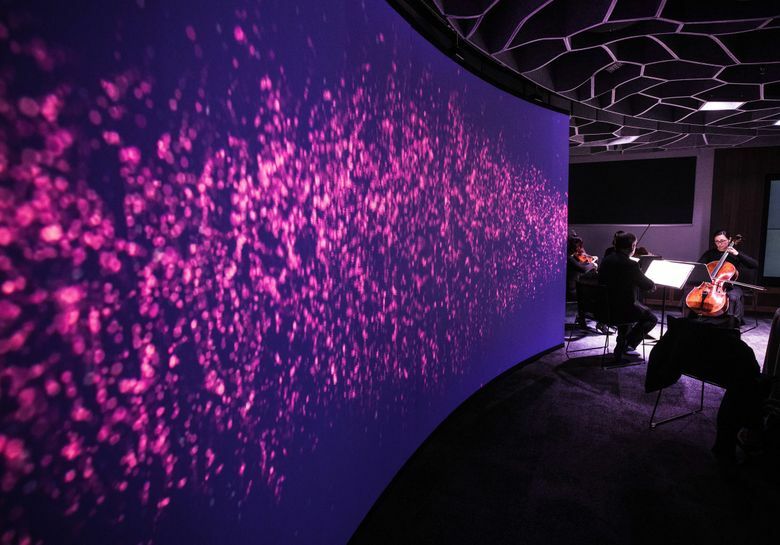 “I’m especially excited about the immersive state we are able to harness and explore, between the acoustics and all the visual capabilities we have worked on,” says cellist and interdisciplinary artist Seth Parker Woods, who has just begun his tenure as Octave 9’s first artist-in-residence (to run through the end of the coming season). Parker Woods is one of a group of artists who were invited to curate individual hourlong segments of the marathon. Asked to plan for the hour from 8 to 9 p.m., he has devised a program (in which he will also be playing cello) featuring four composers whose works involves interactions between live musicians and electronics. Melody Parker is one of the more than 50 living composers whose work will be performed during the marathon. She is also an acoustic engineer and served as the lead designer for the intricate Meyer Sound acoustic system that forms Octave 9’s sonic infrastructure. Parker has written a brand-new sound installation piece to test the potential of a Meyer system known as “Spacemap.” This technology allows musicians to manipulate in real time the complex network of speakers (many of them nested and hidden in a honeycomb design suspended from the low ceiling). “My piece uses the space itself as a compositional device,” explains Parker. 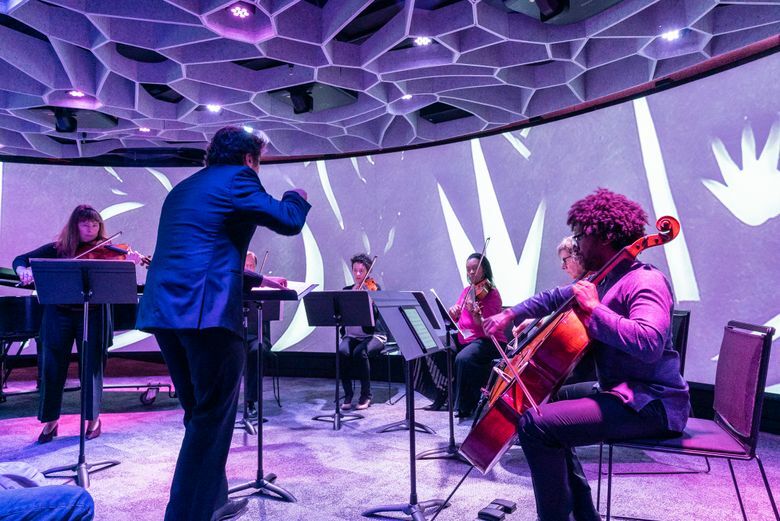 After an ensemble of acoustic musicians prerecorded the music, she processed it through the Spacemap program to create an installation that will become part of Octave 9’s permanent library (and usable as a demonstration piece for artists learning about the space). It will debut as the very first piece in the marathon. Overall, according to Elena Dubinets, Seattle Symphony’s vice president of artistic planning, the contemporary music marathon aims “to celebrate the diversity of music while also expanding its boundaries.” That means not only stylistic boundaries — “from John Luther Adams to jazz to electronic music,” for example — but also “by reinforcing previously unthinkable connections” between live music and electronics, manipulable acoustics and immersive visual elements. Dubinets curated the overarching vision for the whole marathon, which is divided into three “acts”: “Nightfall” (5 p.m. to midnight), “Dreams” (midnight to 8 a.m.) and “Daybreak” (8 a.m. to 5 p.m.). Acts I and III are each divided into separately curated hours featuring changing formations: solo instrumentalists (including several Seattle Symphony musicians), solo singers and small chamber groups. Thomas May writes about the arts for publications in the U.S. and abroad. Blog: www.memeteria.com; on Twitter: @memeteria. This report is supported, in part, by the Rubin Institute for Music Criticism, San Francisco Conservatory of Music, and the Ann and Gordon Getty Foundation.